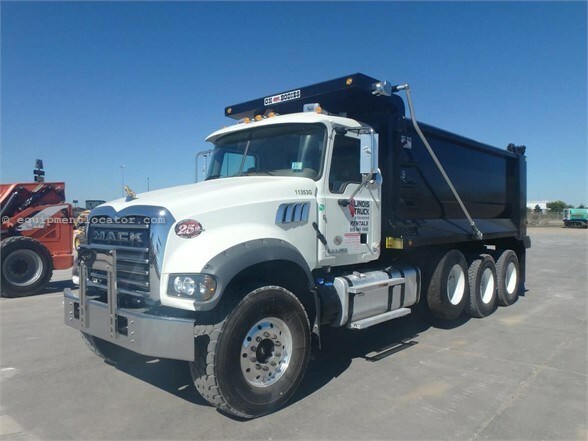 Mack MP-8 45HP T4f diesel,Mack 10 speed,20,000 lbs. front axle,44,000 lbs. rear axle,64,000 GVRW,29,400 EW,227" WB,425/65R22.5 front tires 11R22.5 rear tires tires,air lift 3rd axle,double frame,dual steering boxes,dual lockers,Mack camelback suspension,16' Oxbox,21 yard capacity,electric tarp,engine brake,cruise control,A/C,heated mirrors.